This is a question that some of Blogger (Blogspot Blogger) has asked very often; including me. There is still a doubt within our self, questioning our choose using Blogspot as our blogging platform. Whether it is the right choice? Should i move to WordPress? Which one is better, Blogger or WordPress? Should i move to WordPress? Which one is better, Blogger or WordPress? This is my personal experience as Blogger that used Blogspot as blogging platform. Why do i choose Blogger over WordPress?What can we do in Blogger? What can not we do in Blogger? I've written other article talking about the comparison between Blogger and WordPress from a Blogger user perspective. Most of the article talking about this comparison are made in WordPress platform. So it is very obvious that they will tell that WordPress is better and recommend us to move to WordPress. I try to look at from Blogger perspective. Read : Which one is better, WordPress or Blogger? I'm happy with Blogger despite of its limitation over WordPress. It suit my need as par time Blogger who loves writing in my spare time. So what is your need?Do you need WordPress or Blogger? 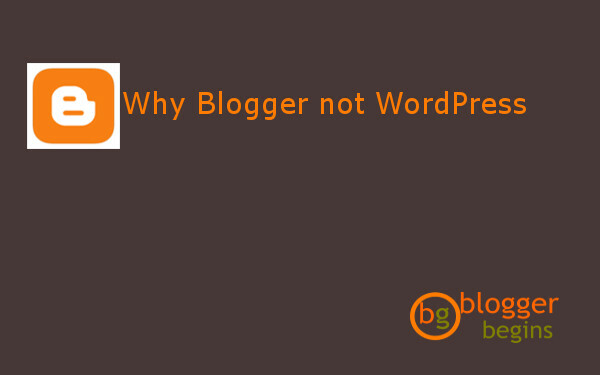 2 Responses to "Why Blogger not WordPress"